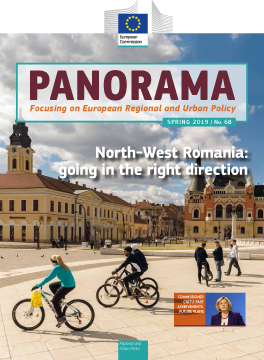 The spring issue of Panorama magazine, which is now available to download, covers a wide range of topics from urban issues to culture and industrial transition. We have an exclusive interview with Commissioner Corina Creţu, looking back over the past four years and what Cohesion Policy has achieved in that time. Our regional focus this time features North-West Romania, with a selection of projects and commentary from the Emil Boc, mayor of Cluj-Napoca and Marcel Ioan Boloş, head of the Regional Development Agency. We also explore the findings of a recent URBACT report into how city authorities can help achieve gender equality in a variety of areas, and find out how the Clean Energy for EU Islands initiative is helping islands generate their own sustainable power. In our In Your Own Words section we have reflections from Czechia and the Kujawsko-Pomorskie region in Poland, and we also hear from younger people via their experiences in the Youth4Regions media programme. And there is a fascinating look at how the benefits of Cohesion Policy were highlighted by a regular national tv show in Estonia. We find out how Interreg programmes have inspired South Korea in their efforts to cooperate with neighbouring countries, analyse the spread of populism and Euroscepticism, and our regular sections on financial instruments and findings from our Open Data portal are also included. The projects section visits Poland, Italy, and the Netherlands.